Its affordable and it doesnt smell bad. This product it very affordable. i like that fact that it is odorless. It doesn't irritate my eyes like most removers. The bottle last forever , even with a few of us sharing. Though it does take quite a bit of this to actually get makeup to come entirely off- particularly mascara- this solution DOES work. Since I'm allergic or sensitive to many of the chemicals in alternative brands, I stick to this one. I use more of it, but at least it doesn't make me break out in rashes! This product is a waste of money!!! 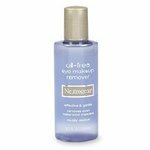 It only removes some of the eye makeup. It did not remove any of my mascara.